Bubbles & Ice is a restaurant specializing in desserts in the Mills-50 District of Orlando. They are connected with a hotpot restaurant called Noodles & Rice (which I've yet to try). The setup of Bubbles & Ice is a bit weird because they appear to be unconnected to Noodles & Rice from the outside. Bubbles & Ice keeps their front door locked and you need to enter Noodles & Rice, walk through the entire restaurant, and then enter Bubbles & Ice through a connecting door in the back of both. This makes getting dessert at Bubbles & Ice a little more complicated than it needs to be for somebody who's never been before. 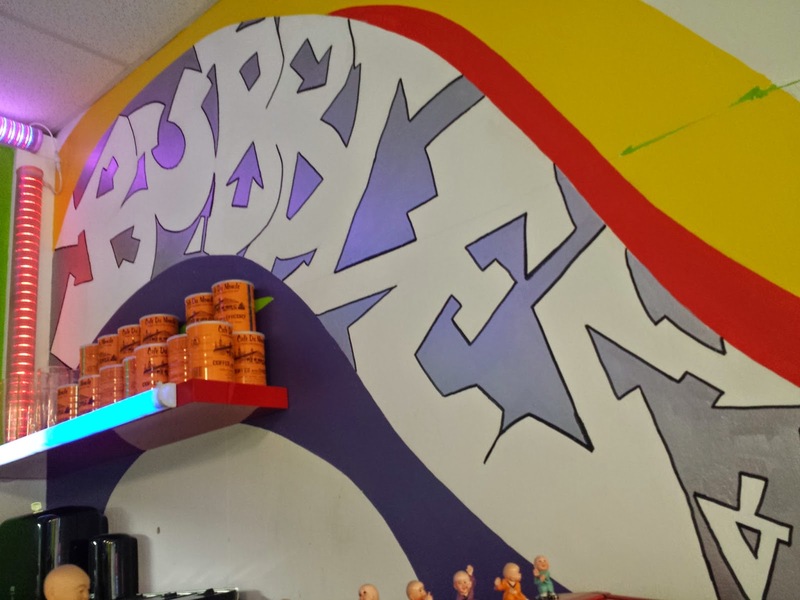 Bubbles & Ice serves a type of shaved ice that they call snow, boba tea, and various other desserts. I have had snow on every visit. 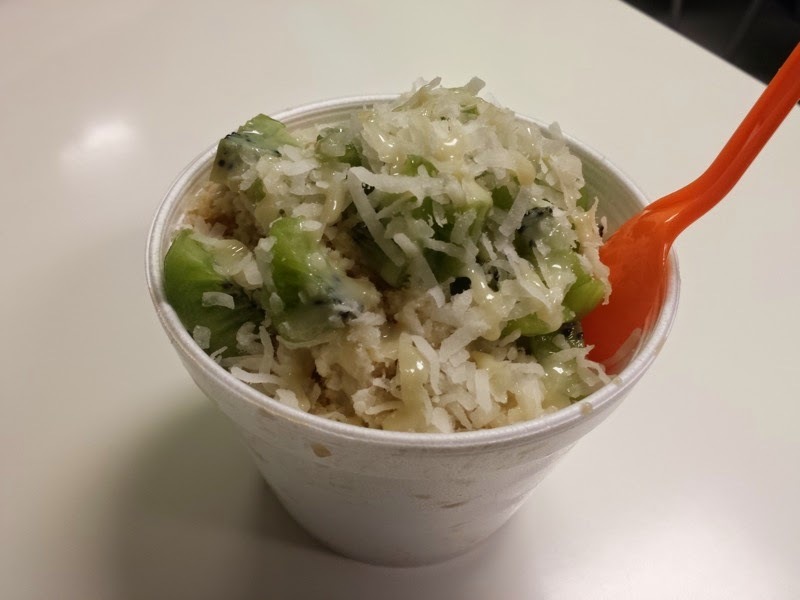 The Snow is a type of shaved ice that can be found in certain restaurants specializing in Asian foods. Rather than being ice and flavor like an American style snow cone, these shaved ices are topped with fruit, sweetened condensed milk, and other toppings. I've had these at a couple other places and Bubbles and Ice is different as in the ice is flavored before it is shaved. The big blocks of flavored ice make the dessert much more uniform as opposed to putting flavor over the ice. My favorite flavor combination which I've had so far has been ginger ice topped with kiwi, coconut, and sweetened condensed milk. The ginger ice had a very nice spicy kick to it which was nicely balanced with the sweetness of the other toppings. 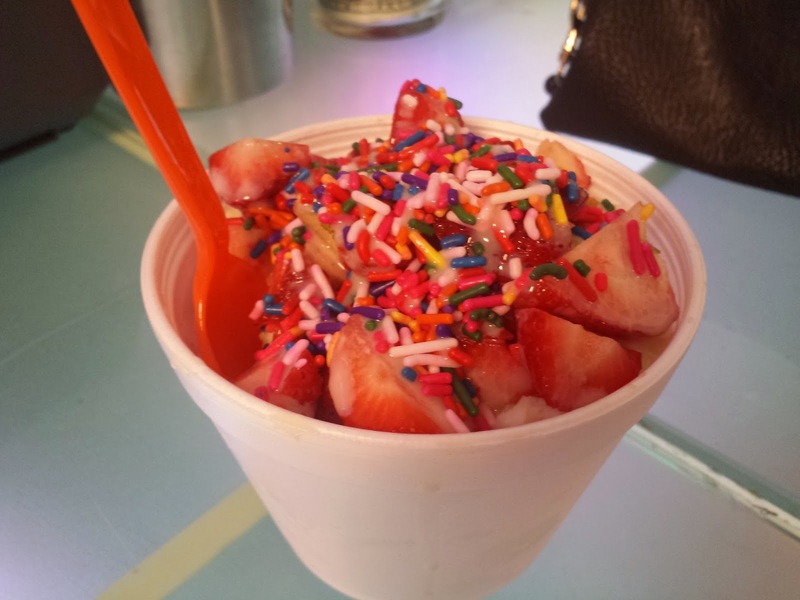 Snow topped with strawberries, rainbow sprinkles, and sweetened condensed milk. 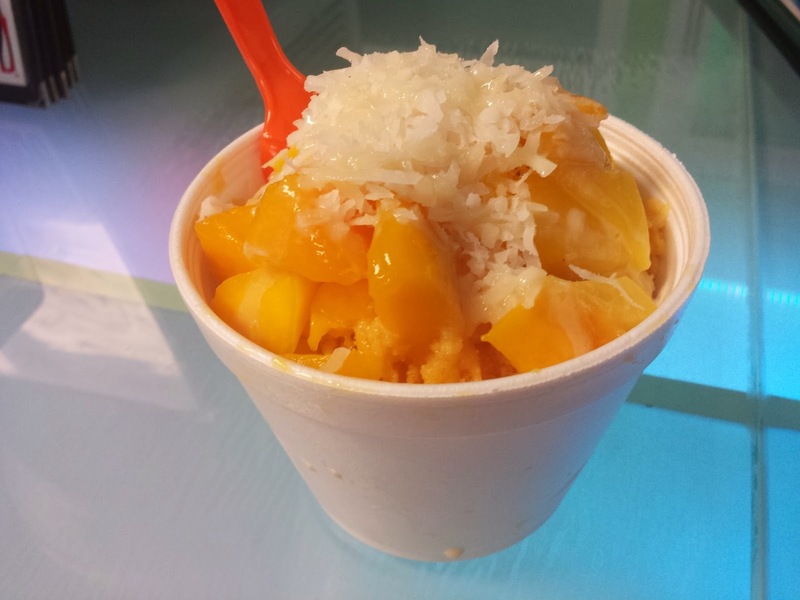 Another flavor combination that I enjoyed was mango snow topped with fresh mango, coconut, and sweetened condensed milk. At some point I'm going to return and try some other desserts besides Bubbles and Ice's snow. I should really try the bubble part of the name to see how it compares to other boba tea in the area. Noodles & Rice is also on my list to try, yet every time I end up at Bubbles & Ice, I've already eaten dinner and am looking for dessert. I must adjust my food planning one evening to remedy this. 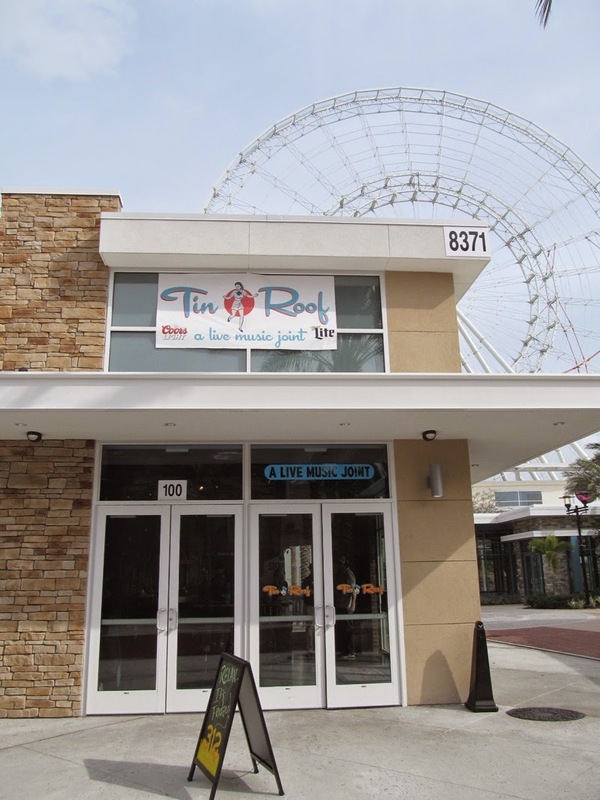 I was invited to the media day happening at The Tin Roof which is now open at I-Drive 360. This new restaurant is located along International Drive, hidden away below the soon to open Orlando Eye ferris wheel. I'm liking the way this section of International Drive is taking shape. The sampling started with Chicken & Waffle Nuggets. These waffles and bits of fried chicken were served in a bucket topped in a bacon-maple syrup. These were tasty with nice flavor in the breading on the chicken. Bacon in the syrup was interesting as well. I wasn't a fan of the presentation though. By the time the bottom of the chicken and waffles was reached, everything became soggy from the syrup pooling at the bottom of the bucket. Creamy Shrimp & Grits: Sauteed shrimp, peppers, and bacon simmered in a spicy tomato sauce atop stone ground white corn grits and marscapone. Baby Back Ribs: Covered in Tin Roof Confidential dry rub. O-Eye Mac & Cheese: Maple smoked white cheddar & breadcrumbs. The Da Lox sandwich sounded good to me. I didn't try the entire sandwich, but I did get to try some of The Tin Roof's Citrus cured salmon which was the main component of the sandwich. I'm a big fan of cured salmon, and this was made fresh at the restaurant. It was served on a cucumber slice with an orange and dill. It was very good. I tried the Cowhorn Pepper Smore Pie for dessert. It consisted of a graham cracker crust, cayenne spicked dark chocolate ganache, and marshmallow brulee. The chocolate was very dense and rich. I'm not sure how much of this dessert I'd be able to handle in one serving. I enjoyed sampling The Tin Roof's food during their media event. Due to their location, I ended up back here the very next day for lunch with a big group from a convention I was attending across the street. I ordered something not featured during the media event called the Hoecake Pile Up. 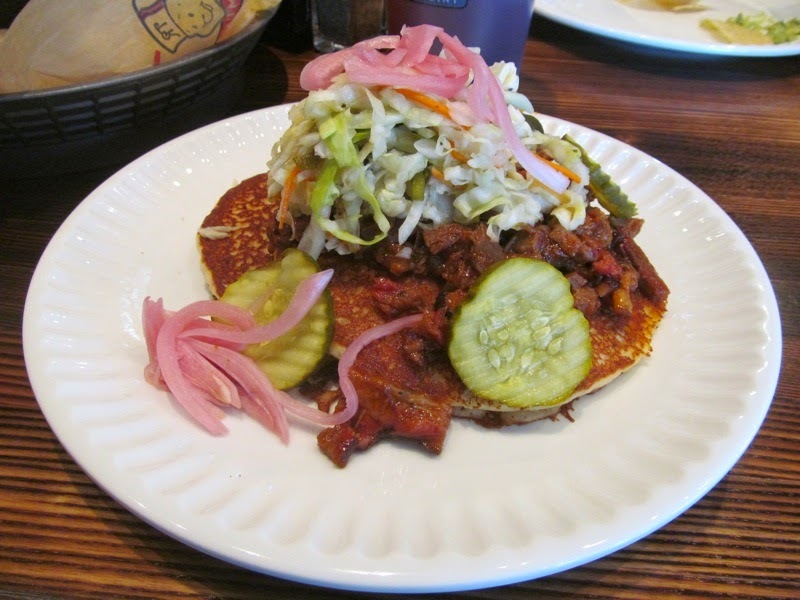 This consisted of cornmeal pancakes topped with bbq brisket, green cabbage slaw, and pickles. I had never heard of a hoecake before, but apparently these are term for cornbread or corn pancakes in certain parts of the south. Breakfast pancakes topped with syrup are good, but I'd take a savory version of a pancake like this any day. The brisket was nice and tender with a good smokey flavor. Coleslaw was good, and I especially liked the pickled onions on top. I've liked pretty much everything I tried at The Tin Roof during the media event and my experience at the restaurant afterwards. That doesn't always happen with media events at new restaurants. That's a good sign for the Tin Roof. Let's hope everything stays good! 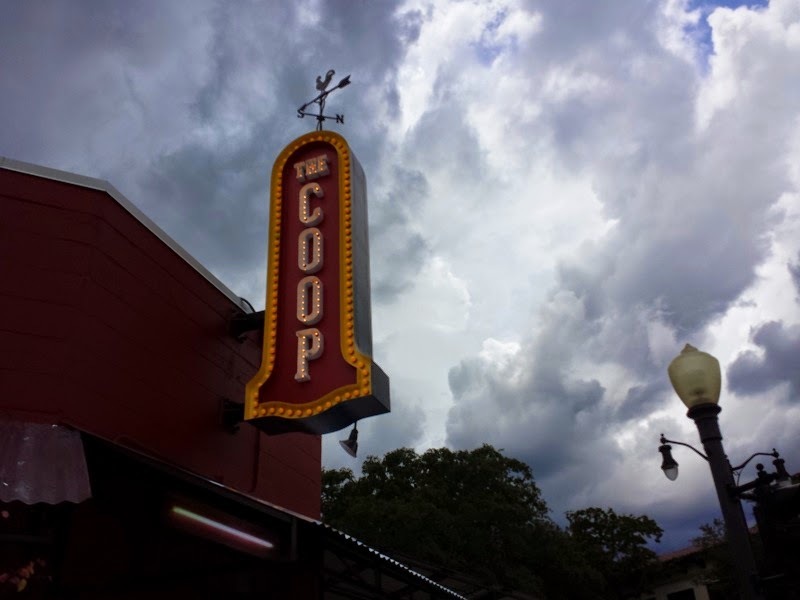 The Coop is a restaurant in Winter Park specializing in Southern foods, specifically fried chicken as the name implies. The Coop is owned by the same people behind the very successful 4 Rivers Smokehouse. I've been to The Coop a couple times now. On my first visit, I ordered the Generous Two Piece Fried Chicken Plate. This came with the chicken, three fixins (side items), and cornbread. The two pieces of chicken had a tasty breading which had a very nice peppery flavor. I've read some criticism of the The Coop's chicken saying it's bland, but it tasted good to me. My issue didn't have to do with the taste of the chicken. It was more the consistency. One of the pieces of chicken was so soggy that the breading was falling off the meat. The other piece was perfectly fine, but soggy fried chicken is not a good thing at a restaurant that claims to specialize in chicken. I liked the Fixins over the chicken. 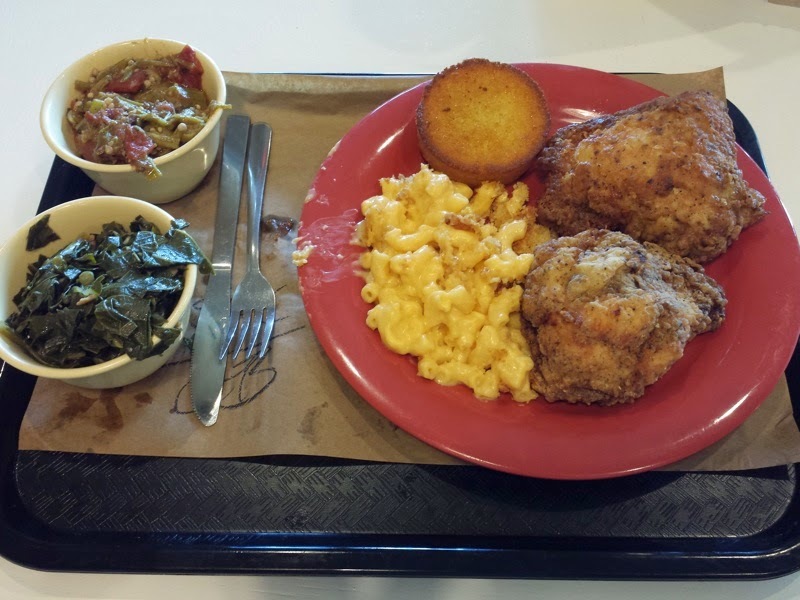 I tried the mac & cheese, southern collards, and stewed okra & tomato. The okra was the best of the three. It was really flavorful and all of the okra's potential sliminess disappeared into the stew. 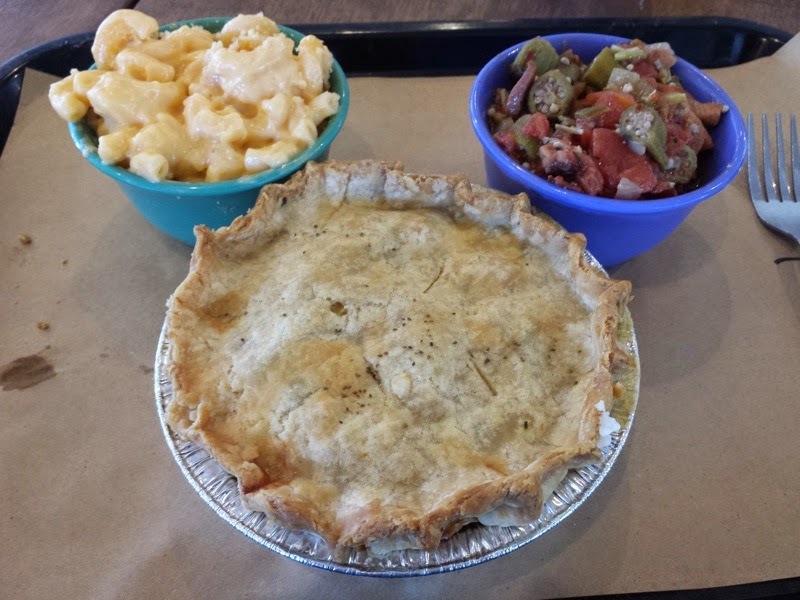 I tried The Coop's Chicken Pot Pie on my second visit. I was unimpressed. The pie crust was good, but the pie fillings could have used a bit of improvement. There was plenty of chicken, but also lots and lots of corn. There was more corn in the pie than anything else. I found a few green beans as well, but they were hidden by all the corn in the pie. It tasted alright, but wasn't anything to write home about. I also had the macaroni and stewed okra for my sides once again. The macaroni was consistent with the my first visit to The Coop. Unfortunately the okra was really bland compared to my first experience. I was driving home one night and passed The Hourglass Brewery in Longwood. Sitting in their parking lot was one of the coolest looking food trucks I've come across. 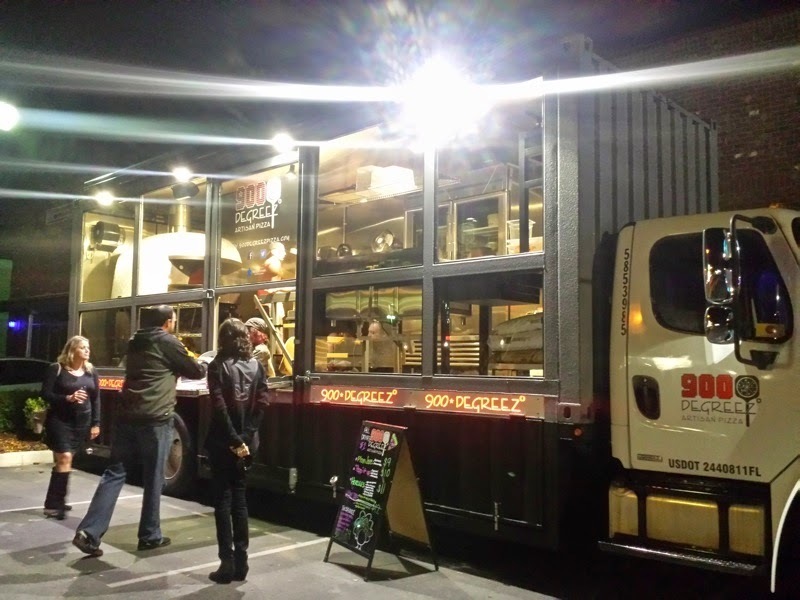 They were called 900 Degreez and consisted of a shipping container with one side removed and replaced with glass windows, equipped with a pizza oven and kitchen inside. All this was on the back of a truck. I had seen 900 Degreez posting on Twitter and Facebook, but had never come across the truck in person. The uniqueness of the truck design alone made me stop and buy a pizza. I ordered the Hercules Pizza. Their oven was very quick, cooking the pie in about 90 seconds. 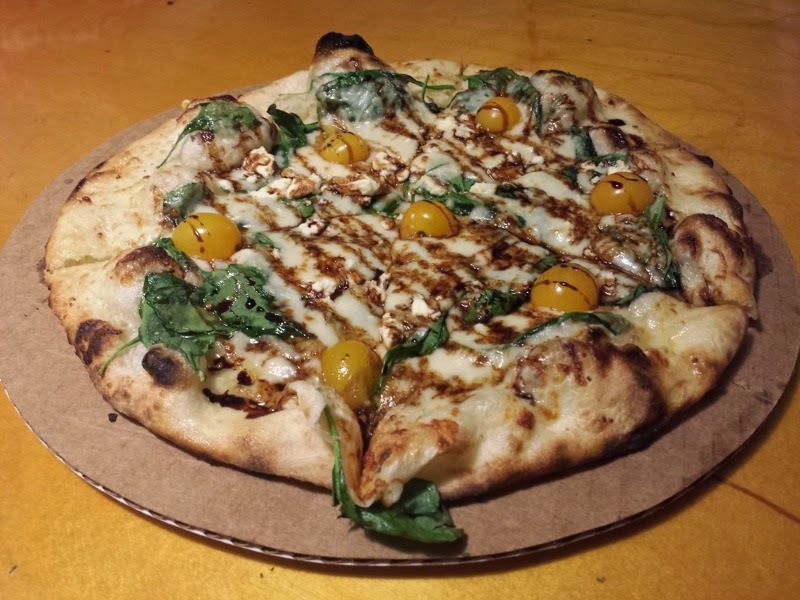 The pie was topped with spinach, yellow tomatoes, feta, and a balsamic vinaigrette sauce. The balsamic was the weird part of the pizza. Vinegar was the dominant smell wafting off the pie which overpowering the familiar pizza smell. Pizza that doesn't smell like pizza is unexpected, but tasting the pizza was different though. The balsamic actually went well on the pizza and blended very nicely with the rest of the flavors. The pizza's crust was thin and crispy. There was a good proportion of cheese to other toppings. If my memory serves me correctly, this was the first time I've ever had pizza cooked on the back of a truck. It's definitely the first time eating a pizza from a truck as nice looking as 900 Degreez. To top it off, I liked the pizza too (except for the vinegar smell). 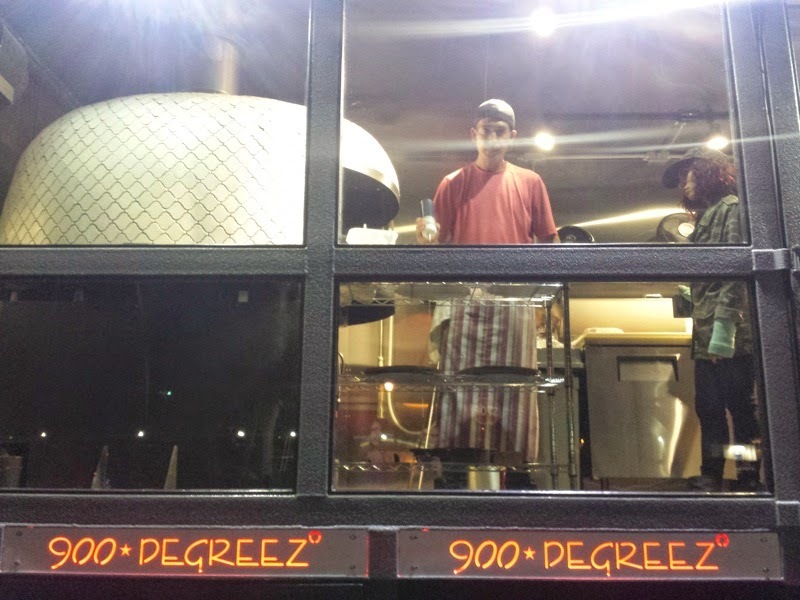 I'd get pizza from 900 Degreez again!